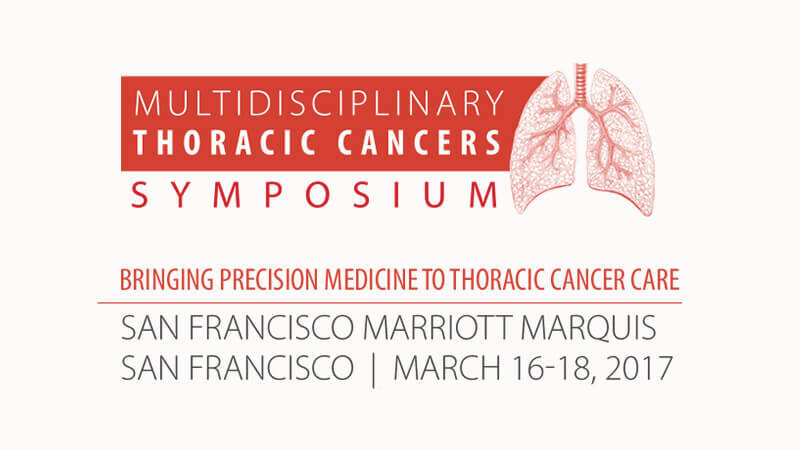 The 2017 Multidisciplinary Thoracic Cancer Symposium is a two-and-a-half day meeting featuring interactive case discussions; educational sessions on new multidisciplinary therapies, new targeted therapies, immunotherapy, treatment and screening guidelines, supportive care; and oral abstract sessions highlighting the most current, evidence-based practices. The goal of this meeting is to provide participants with updates on current early phase clinical and translational initiatives in thoracic malignancies, including targeted therapy, immunotherapy, advanced radiation and surgical methodologies, and pathological advancements in molecular categorization that are relevant to daily clinical practice. Additionally, there are updates on the appropriate integration of all the advancements in daily practice, including indication, patient selection, combinations of different therapeutic modalities, prevention and management of common toxicities. Support for the 2017 Multidisciplinary Thoracic Cancers Symposium Virtual Meeting is provided by: Bristol Myers Squibb. © 2019 American Society for Radiation Oncology.